Jennifer Pluta has tackled U.S. Army basic training, operated an asphalt dump truck to help build security points near the Kuwait and Iraqi borders and serves as a master sergeant in the Army Reserve Careers Division. 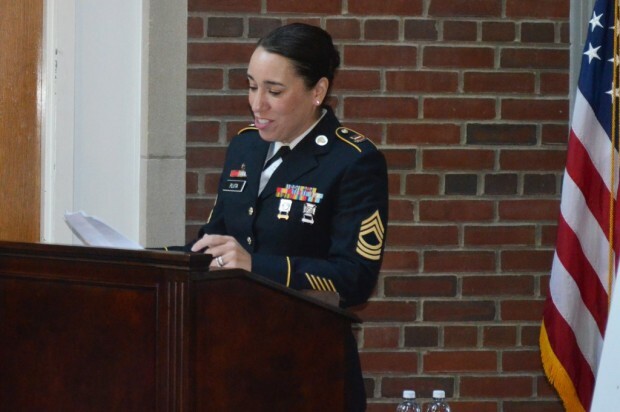 She understands the rigors and the depth of skills and knowledge that come with a life in the military—and the challenges in translating that experience to future employers. Pluta is the assistant director of veteran career services in Career Services and the Office of Veteran and Military Affairs, where she assists student veterans and the military family community at the University. 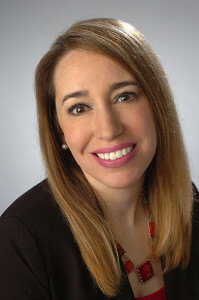 Along with helping student veterans and their family members with career counseling, resume writing and other career development needs, she builds relationships with employers interested in hiring veterans. Pluta, who earned a B.A. in sociology from Alfred University and an M.S. in higher education administration from Syracuse University, enlisted in the U.S. Army Reserve in 1999. She was assigned to the 770th Engineer Company, Construction Support, in Penn Yan, New York, and completed basic training. In 2003, she was deployed as part of Operation Enduring Freedom and Operation Iraqi Freedom. She operated a dump truck to build up infrastructure through paving operations at posts and main supply routes in Kuwait and Iraq. The following year she was transferred to the 77th Retention and Transition Office as an Army Reserve career counselor and later joined the quality assurance team to focus on retention, training and quality controls. Jennifer Pluta, assistant director of veteran career services in Career Services and the Office of Veteran and Military Affairs, spoke this week at the Employer Support for the Guard and Reserve signing ceremony with Chancellor Kent Syverud to highlight her appreciation for the University’s support of her time away with her military commitments. She has earned Army Achievement Medals, Army Reserve Component Achievement Medals, National Defense Service Ribbon, Global War on Terrorism Expeditionary Medal, Iraqi Campaign Medal, NCO Professional Development Ribbon, Joint Meritorious Unit Commendation and Army Reserve Career Counselor Badge, among many other honors. As an active member of the Army Reserve, Pluta balances her work life with her commitment as a soldier. She spoke this week at the Employer Support for the Guard and Reserve signing ceremony with Chancellor Kent Syverud to highlight her appreciation for the University’s support of her time away with her military commitments. 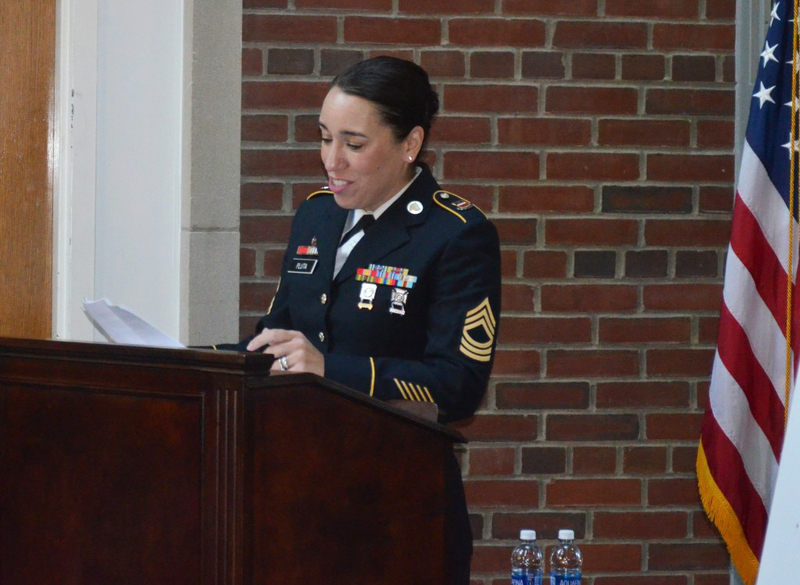 Pluta recently spoke about her work with student veterans and what it means to her. Q: Why did you decide to join the U.S. Army? A: At a young age, I felt very strongly that as an American I needed to serve my county in support of the freedoms we receive and the sacrifices of those who came before me. Q: Do veterans have any different challenges to entering/re-entering the workforce from college and military life? A: In my experience, one of the biggest challenges when working with student veterans is having them to be able to appreciate and articulate the value of their military experience on their resume, cover letter and interviews as it relates to their chosen career path. The other challenge is working with employers and students to find the right employment opportunities; veterans are not necessarily an ideal candidate for entry-level positions given their leadership skills, maturity, and knowledge. On the other hand, they may not have the necessary experience for experienced-level positions. So, there is some negotiation between the student veteran and employer to find the right position that meets both of their needs. 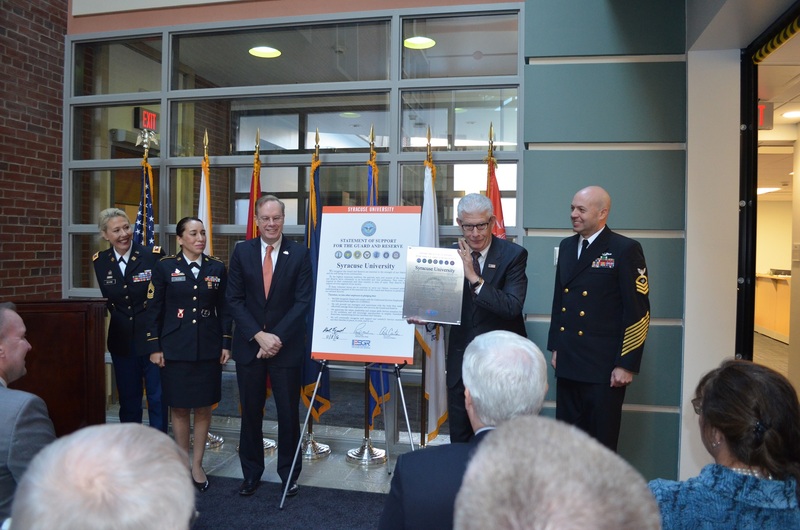 Jennifer Pluta, second from left, attended the Employer Support for the Guard and Reserve signing ceremony this week. From left, are U.S. Army Col. 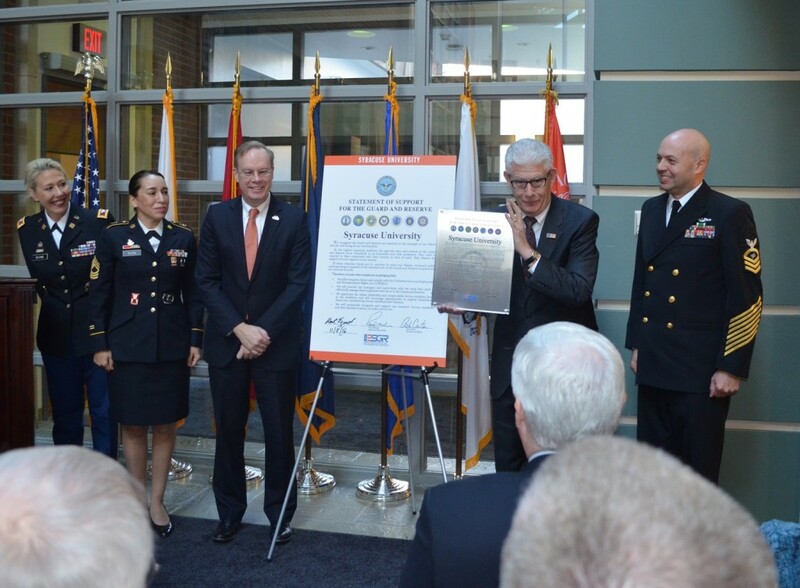 Dawn Devine, ESGR chief of military engagement; Pluta; Chancellor Kent Syverud; Tom Bullock, ESGR chief of employer engagement; and USNR Chief Petty Officer Jake VanMarter, president of the University’s veteran affinity group. Q: How can you relate to veterans entering the workforce as a veteran yourself? A: Thus far, student veterans education and military career pathways have been laid out in front of them—every test, task, assignment and schedule—and now, it is up to them to decide their next step. They need to identify and articulate their chosen field, industry, location and the level of responsibilities they are seeking in their ideal job—all of which can be daunting and overwhelming to have a range of choices to decide. I can understand those emotions as they transition from structured environments in which their pathways were identified for them to now having the responsibility of identifying and pursuing their career pathway. Q: Why is this work important to you? A: Since college I have had a fascination and keen interest in the process that one undertakes to determine and pursue their chosen career trajectory. Oddly enough, not only have I been able to support students with their career pathways but I also support soldiers in the Army Reserve with their careers as part of my work as an Army Reserve Career counselor. I enjoy serving my sisters and brothers in arms to reach and achieve their potential in all that they do. I truly am blessed and privileged to do the work that I do at SU and in the Reserve.